Tim Doyle, comes from a music rich family in North county Wicklow and started playing the whistle under the guidance of his father and older brother at a very young age. He started both traditional and classical violin at the age of 7, but not happy with being a one-instrument player took up the Concertina and Uilleann Pipes soon after. Tim has been a multiple prizewinner at music festivals in both traditional and classical music, including two all-Ireland titles on the Uilleann Pipes, but enjoys nothing more than arranging and performing music as part of a group or ensemble. He is currently part of two traditional music ensembles and gigs regularly in South Dublin/North Wicklow. He is also one of the founding members and current artistic director of one of Dublin’s newest orchestras Téada Orchestra, who have featured on RTÉ Lyric FM. 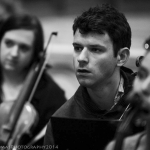 Tim studied music at third level at TCD and the RIAM, obtaining an honours degree in composition and a diploma in music teaching and performance. He teaches on the Traditional music and Sting programmes for Music Generation Carlow, and is delighted to have been asked to join the Music Generation Wicklow panel. As a composer Tim has written in both the classical and traditional idioms, and has written suite to commemorate the Battle of Clontarf (2014) and the centenary of the 1916 rising (2016).